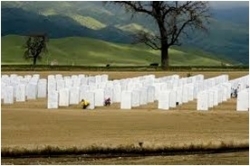 Created and maintained a resource and cost-loaded Project Primavera Planner (P3) schedule for a federally funded 50-acre cemetery project that included four buildings, 4000 pre-placed crypts, 4000 in-ground cremation sites and 3000 columbarium niches. Project plans also include numerous honor walls, a flag assembly area, memorial walkway and two committal shelters. Completed time impact analysis and submitted monthly progress with earned value reports to Department of Veterans Affairs and project owner regarding project status and for use as the basis for determining progress payments.